We recommend the following Quoll products for you if you have a life-threatening allergy. What if you had 3 minutes left to live? When allergies are serious and life-threatening, it’s imperative that life-saving information is kept up to date at all times and that it is readily visible to those who will be called upon to provide emergency care. Anaphylactic shock can occur within 3 to 30 minutes of exposure to the allergen. Knowing what to treat and how to do so is critical to the patient’s survival. When properly treated, there is a far greater likelihood of a successful outcome. Don’t risk those precious extra moments. Be ready for any emergency, however likely or unlikely it may be! First responders (ambulance, paramedics, police and other emergency situation attendees) are trained to look for a patient’s medical ID. Help them to help you. Anyone can suffer from a life-threatening allergy and being able to communicate this can mean the difference between life and death. Consider how difficult this communication can be for children, the disabled, the deaf, the visually-impaired and the elderly, all of whom need help to explain their condition. Any sufferer – including able-bodied adults – can experience difficulties communicating when their body is under attack by an allergen. What if this were to happen to you or your loved one with a life-threatening allergy? Your child is alarmingly allergic to bee stings and is stung by a bee at a friend’s party. Your highly allergic child is given food containing peanuts or wheat (or another allergen) at school camp. Your elderly mother is severely allergic to ibuprofen but is given a couple of tablets for a headache by a well-meaning friend. 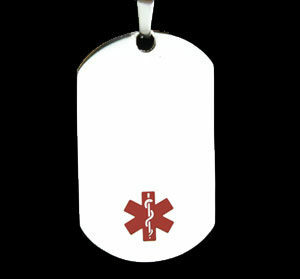 You are injured in an accident and have a life-threatening reaction to morphine. Your father has dementia, has cut his arm and is terribly allergic to the adhesive of medical tape. your immediate caregiver will see that you have an important medical issue. By scanning the QR code, they will have instant access to the information that will help them know what to do.